On my last visit to Brighton (or London-on-Sea as some cheekily call it), I ate at Terre a Terre, a vegetarian restaurant, and was far from impressed. On my most recent visit to Brighton I dined at Terre a Terre’s arch-rival, the long-established Food For Friends (FFF) with Brighton resident The Prancing Hippy. While Terre a Terre has a fairly conventional floor plan, Food For Friends has a rather quirky layout and feels like two conservatories joined together by a narrow hallway. The décor is inoffensive and the service is friendly and reasonably efficient, if a little rushed off their feet. I was content to pick and choose my way through the full a la carte menu, while the Hippy plumped for the simplicity and fixed price of the set lunch menu. Unlike some other restaurants, some of FFF’s key dishes are available on the set menu so it’s hardly a dumbed down compromise. 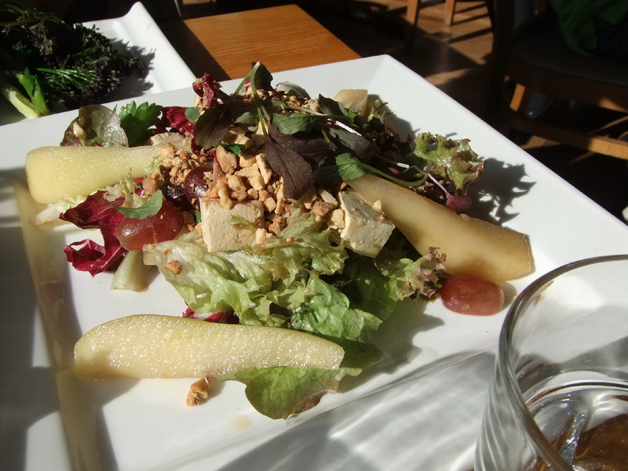 Fittingly for a vegetarian menu, dishes are marked with abbreviations indicating whether they are vegan or gluten friendly and while superficially similar to Terre a Terre’s menu, the dishes are far less fussy. The Prancing Hippy was pleased with his starter of polenta chips, which were massive enough to resemble vegetarian fish fingers than chips. The crisp chips had a coarse exterior that gave way to a distinctly flavoured parmesan interior although this was at the expense of the polenta. The pickled beets added a pleasing tartness and gentle sweetness, but the roasted, marinated peppers failed to leave much of an impression. Not a bad starter, but the parmesan may have been an unnecessary addition. 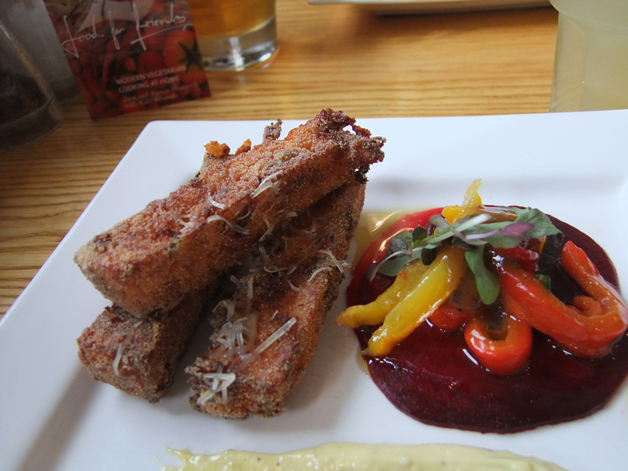 More like polenta fish fingers. Although the Hippy was pleased with his sampling of my spiced cashew, smoked tofu, pear and grape salad, I was underwhelmed. The refrigerated, under ripe pears need more time on the tree, while the grapes and tofu failed to leave much of an impression. The only consolation was how the crumbly crunch of the cashews contrasted nicely with the bitter leaves and the sharp vinegarish edge of the dressing. The mediocre nature of the cashew and tofu salad is all the more surprising given the far more accomplished nature of the tofu pockets. These vaguely maki-style rolls of tofu wrapped around rice and vegetables were surprisingly good. The tofu wrappings were silky and sweet thanks to a delicate mirin glaze. One roll was filled with silky mushrooms and crisp spring onions, while the other was filled with roasted butternut squash blessed with an extra brushing of salty miso. The smoky cashews added an extra depth of flavour to both rolls, while the sweet pickled root vegetable shavings provided a sharp, refreshing finish. 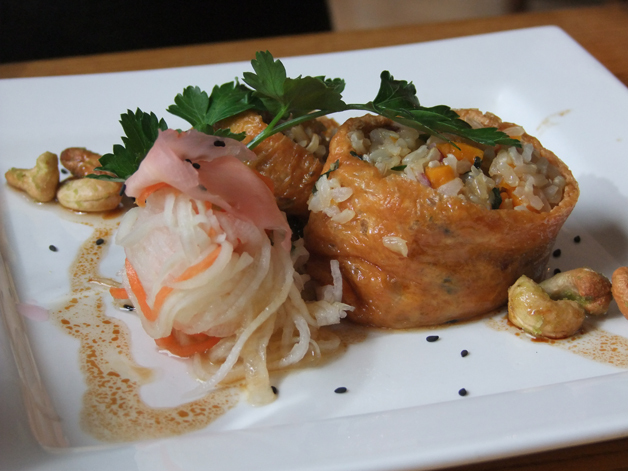 It’s no surprise that the tofu pockets are one of The Prancing Hippy’s favourite dishes at FFF. More like a tofu roll. My main course was a bean burger compose of garbanzo and cannellini beans. The moist, nutty, tangy bean patty was complimented well by the tangy sweetness of the tomato and shallot chutney, but the dimpled English muffins struggle to hold the burger together with lots of resulting spillage. This is especially true once the accompaniments of mushrooms and smoked cheddar are taken into consideration – and the latter is just as blasphemous as it sounds. 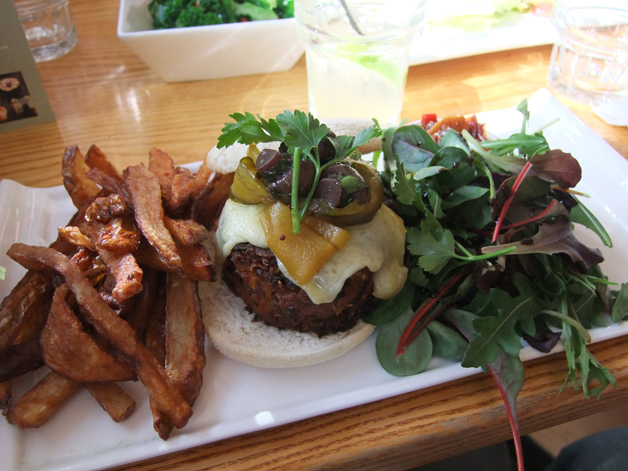 The bean burger was still nonetheless very enjoyable, although the kitchen needs to go back to the drawing board when it comes to the wrinkly, rather limp root vegetable chips. The Hippy’s main was a rather old school vegetarian dish. 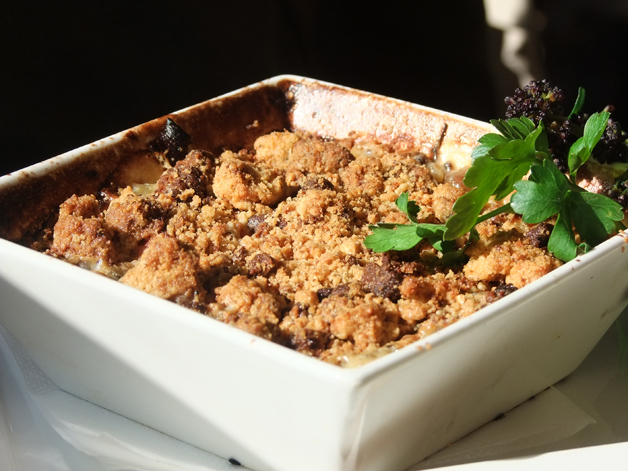 The savoury leek and cheddar crumble starts off with creamy melted cheddar mixed with chopped leeks, smoked paprika and served with a side dish of purple sprouting broccoli. The crusty, mildly spicy top layer didn’t really mesh well with the rest of the creamy dish, but the Hippy enjoyed it nonetheless. The light – it burns us! 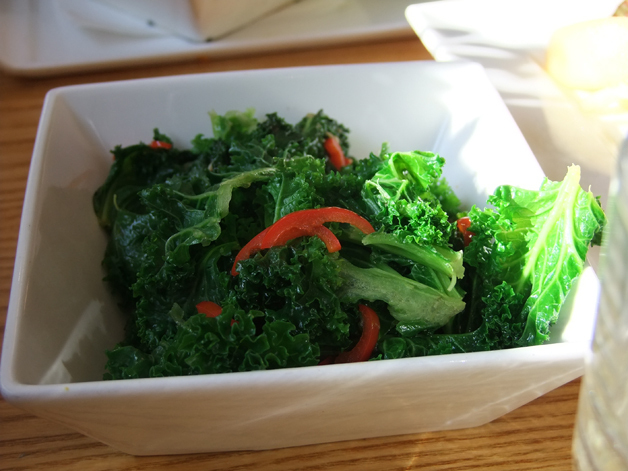 Our side dish of kale was suitably wrinkly, but it wasn’t as salty as I was expecting. The added chilli was very tame – so tame that I could taste more of the added garlic than the chilli. After all of that, the Hippy was in need of a refreshing palate cleanser and he got it in the form an ice cream selection served in a biscuit basket for his dessert. The mango sorbet was distinctive and refreshing, but the coffee and raspberry flavours didn’t leave much of an impression. Yes, you can eat the basket if you really want to. 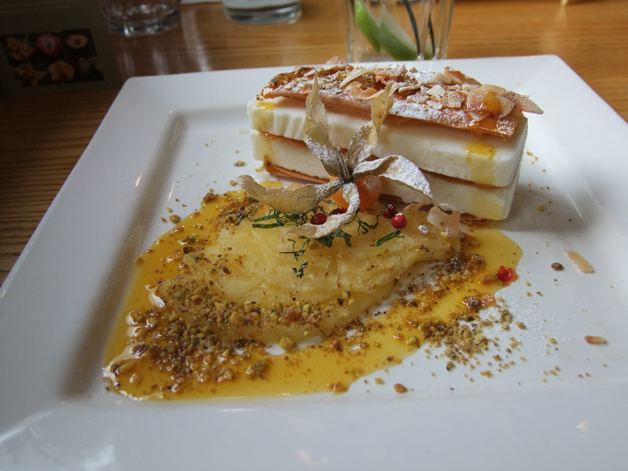 The frozen coconut yoghurt mille-feuille was the most intriguing sounding dessert on the menu. The frozen coconut yoghurt was tart and refreshing, but it was also cold, hard and unforgiving – if the Brutalists had designed a sorbet, this is what it would be like. Oddly interspersed between the layers of frozen yogurt were thin, crisp layers of pineapple pastry but these didn’t sit well with the hard blocks of yogurt which also drowned out the delicate fruit coulis. The juicy slices of pineapple sitting in the coulis were no wallflowers though – when eaten with the frozen yogurt blocks, they made them taste more like pineapple than yogurt. 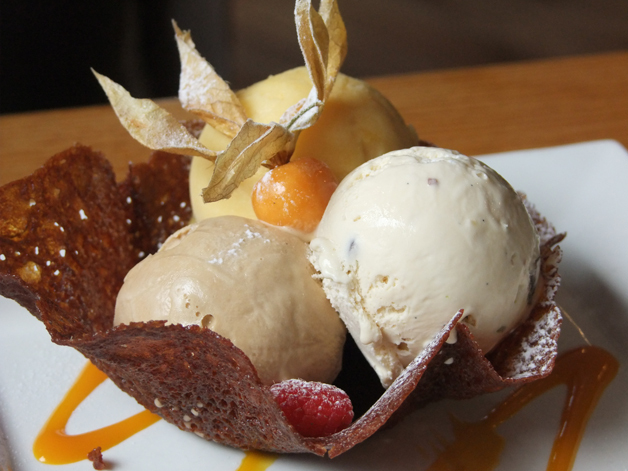 Overall, a rather bizarre, disjointed dessert of conflicting flavours and textures that just doesn’t work. 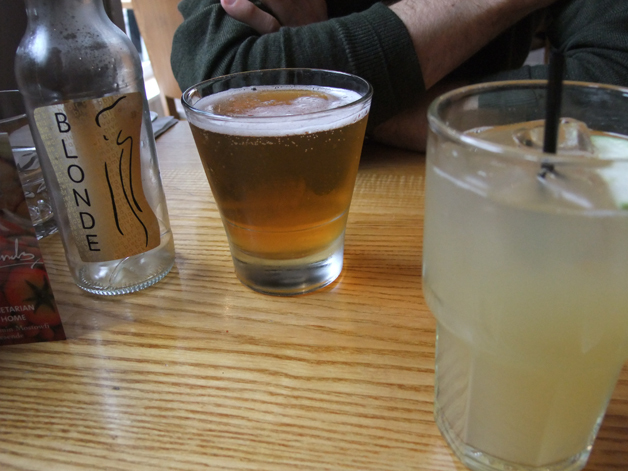 While I was content to wash down my food with some water and then apple juice, the Prancing Hippy opted for the blonde beer which he found refreshing and smooth, almost like a wheat beer. Food For Friends is far superior to Terre a Terre. While FFF isn’t perfect with some noticeable misses nestled in amongst its menu, it does have some dishes which are worth having if you happen to find yourself in Brighton and can nab a table. Although recommended, it’s still only a qualified recommendation since Food For Friends just isn’t as accomplished as London’s Orchard. Comparing the two may be a little unfair, as you’re hardly likely to choose one over the other by hopping on the train, but the point is that FFF’s rather scattershot execution is ripe for being overtaken by some other plucky, better vegetarian upstart. Given the apparently static nature of Brighton’s restaurant scene however, this seems unlikely to happen anytime soon. Opening Hours: Sunday-Thursday noon-22.00. Friday-Saturday noon-22.30. Tags: bean, brighton, burger, cheese, coconut, crumble, food with friends, frozen yoghurt, ice cream, kale, leek, pineapple, polenta, restaurant, review, salad, tofu. Bookmark the permalink.